Battle Chasers: Nightwar is a wonderful homage to early ’90s JRPGs, or as the developers put it – a love letter to the genre. The game is based on a graphic novel that was published in the ’90s, created by Joe Madureira. Madureira is the co-founder of Airship Syndicate, the developers of Battle Chasers: Nightwar, and also served as the creative director of Darksiders. And it shows. Nightwar drops you into the shoes of a young girl named Gully, who inherits a pair of magical gauntlets after her father’s disappearance. Gully goes out on a quest to find her father, and along the way assembles a group of unlikely allies: the tough mercenary Garison, the old wizard Knolan, and the friendly war golem Calibretto. Even though the opening moments did not blow me away, the plot does pick up fairly quickly and ends up being one of the game’s strongest aspects. It’s intriguing and enjoyable, and has its fair share of surprising twists. Even though the game categorizes itself as a JRPG, you won’t find many of the staples of the genre. There’s no forced romance between characters and no overly dramatic or emotional scenes. However, you’ll still find deep characters, with real personality and a rich background that help you relate to the story. Yet, I still expect more interaction between members of my party. It’s there, but most of it happens during downtime in the inn, and not during actual gameplay. I would’ve liked to see more of an emphasis on character relationships. The combat system is turned-based and really simple to use. Every character has a set of actions it can perform that earn you Overdrive points. Overdrive points can replace Mana when you use special attacks, and also grant certain bonuses, like a 0.4% increase to damage dealt for every point you earn. These points do not carry over to the next battle, so there’s no reason to hold back or conserve your special actions (other than the fact they do take time to recharge). In addition, every time your character performs an action or take damage, your Burst bar is increased. Once full, you can use a powerful Burst attack. Combat is diverse enough to allow for several tactics against all kinds of enemies. These enemies won’t hesitate to fight dirty or use their own special attacks (including Burst). 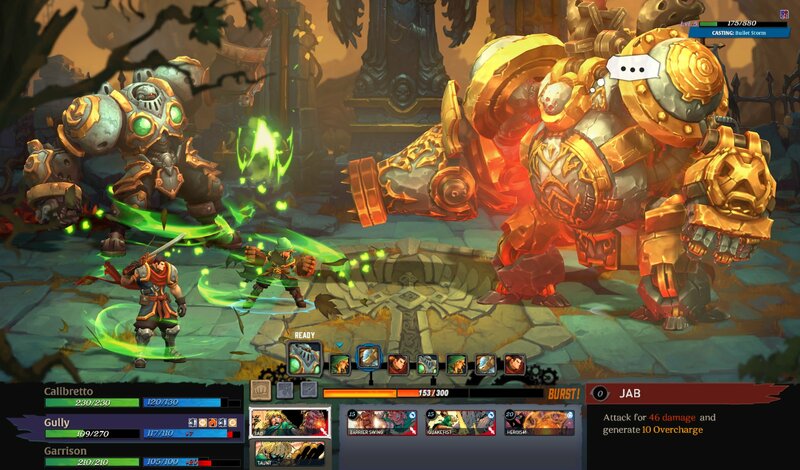 The battles in Battle Chasers move between real easy to challenging, and they’re pretty balanced overall, even though battles for the sake of XP grinding can be quite tedious. The game world is rich in both color and detail, and the environments and characters are all designed according to the comic book. Thanks to the attention to details in every aspect of the characters and environments, everything looks and sounds really nice. You can definitely see a little bit of Darksiders in this game, though it isn’t all that surprising considering Joe Madureira was heavily involved in both games. Exploring the world is done in 2 ways. The first is through the world map, which makes you think of a pirate treasure map. This map is fairly big, and is full of points of interest, like dungeons, hidden treasures and random enemies. Some areas will only open to you once you advance in the story, and you can always backtrack to previous areas using the teleportation (fast-travel) points scattered around the map. When you enter a dungeon, the map switches to an isometric view where you control one party member of your choice. 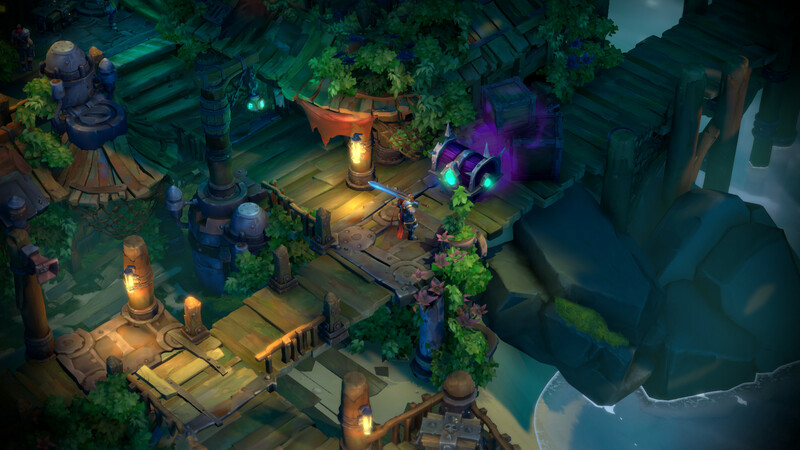 Dungeons are where you’ll spend most of your time in Battle Chasers: Nightwar. Each of them is made up of a few pre-determined rooms mixed in with randomly generated ones to create a new map every time we explore. The rooms all fit in great together, and you won’t realize it’s a randomly generated dungeon until the second time you play through it. Every room is highly detailed and can consist of several floors and even different interiors. Apart from enemies, dungeons contain puzzles, treasures, weapons upgrades, potion mixing stands and more. If you missed anything, you can always backtrack using one of the teleportation nodes scattered around the dungeon. When not exploring dungeons, you can go back to your base of operations – the town of Harm’s Way. Harm’s Way is your typical RPG town, with everything an adventurer might need – a blacksmith, ye old shoppe and an inn for you to let loose after a long day of RPGing. Each of these institutions can be upgraded to offer more items and goods. Upgrading a store also allows you to buy plans for new items and weapons upgrades you can then craft yourself. 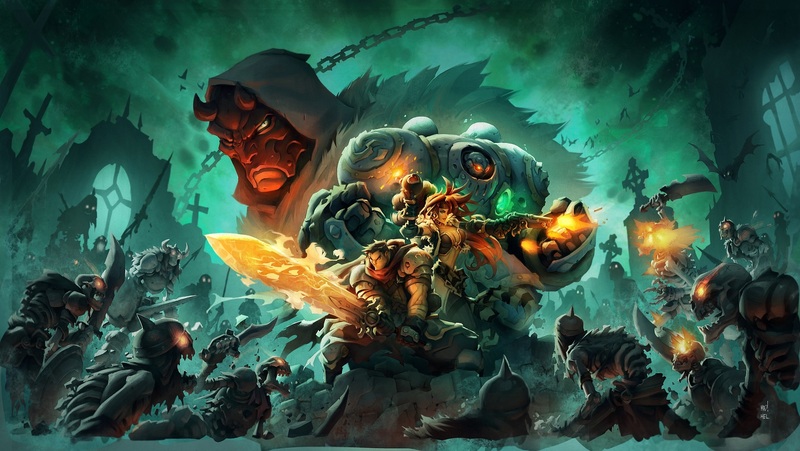 If you’re into classic RPGs from the 1990s, you’ll probably love Battle Chasers: Nightwar. It’s a wonderful RPG with a great story and cool comic book-like vibe to it. 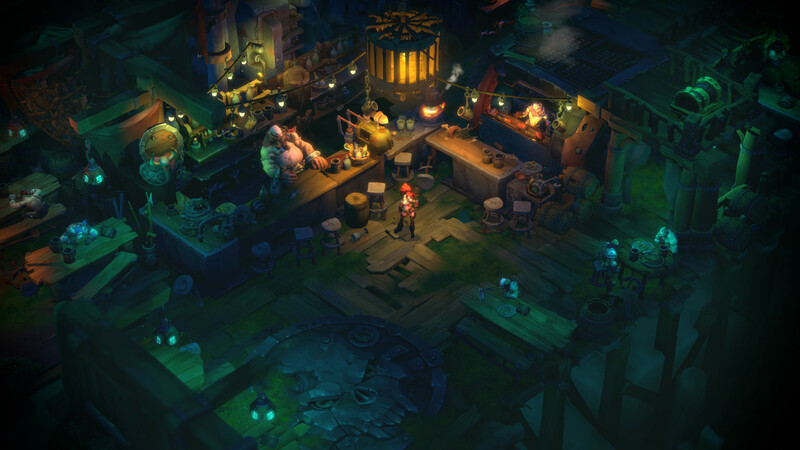 We’ve encountered quite a few crowdfunded and Kickstarted indie games, but Battle Chasers: Nightwar belongs to a chosen elite of crowdfunded indie games that don’t feel or look like ones. It has plenty of exciting content and polish that give much larger studios a run for their money.